ETC Institute was founded in 1982 by Dr. Elaine Tatham to help local governmental organizations gather data from residents to enhance community planning. ETC has grown from a small one-person company to a national corporation. Since its founding, ETC Institute has completed research projects and surveys for clients in 49 states. This includes thousands of surveys, focus groups, and stakeholder meetings. During the past five years alone, ETC Institute has administered surveys in more than 700 cities and counties across the United States. 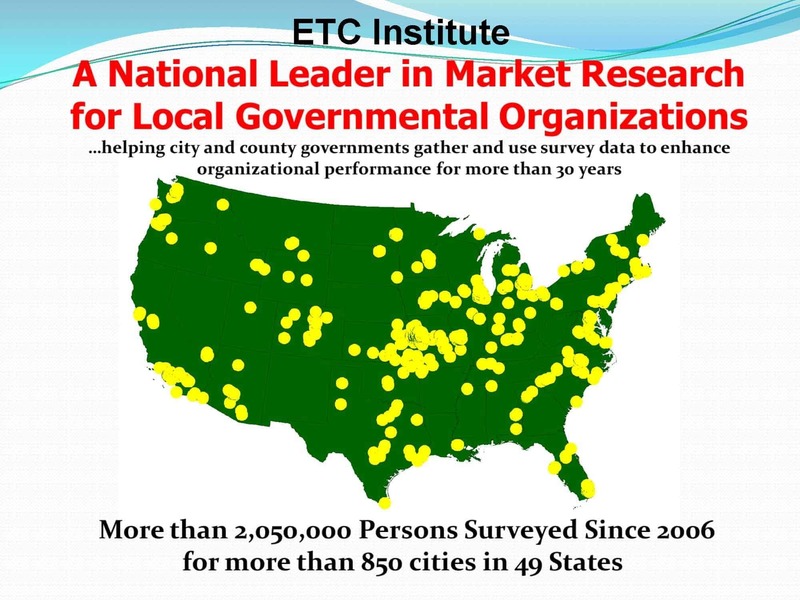 ETC Institute has conducted research for more major U.S. cities than any other firm. ETC Institute recently ranked 3,459 among the “Top 5,000” fastest growing private companies. ETC Institute was awarded the Greater Kansas City Chamber of Commerce’s “Top 10 Small Business of the Year Award“. ETC Institute was selected from more than 1,700 nominees for the award. Commitment to quality and superior customer service were two of the reasons the firm was selected. ETC Institute was selected as one of the “Best Places to Work in Greater Kansas City” by the Kansas City Business Journal. ETC Institute received special recognition for our commitment to having a diverse work environment with regard to race/ethnicity, gender, faith, physical ability, and age. For three consecutive years, ETC Institute was selected as one of the “Top 100 Fastest Growing Companies in the Kansas City Area” by Ingram’s Kansas City Business Journal.